By default, all projects within your account are set up for Account Level Billing, meaning that all of your line items across all projects are rolled into one invoice. Once additional projects are added by a 3Play Media team member you can opt for either Project or Account level billing. Configuring Project Level Billing will also need to be implemented by a 3Play Media staff member. With Project Level Billing enabled, a separate invoice is created that represents the activity from a particular project. Closed Invoices will need to be paid individually when Project Level Billing is enabled whereas Account Level Billing configured accounts pay one closed invoice that represents activity across all projects. Separate payment methods and different credit cards can be used to pay closed invoices with Project Level Billing. Once Project Level Billing is enabled a Super User with Billing permissions will still need to pay the invoices as Project Users cannot have billing and invoice permissions enabled. 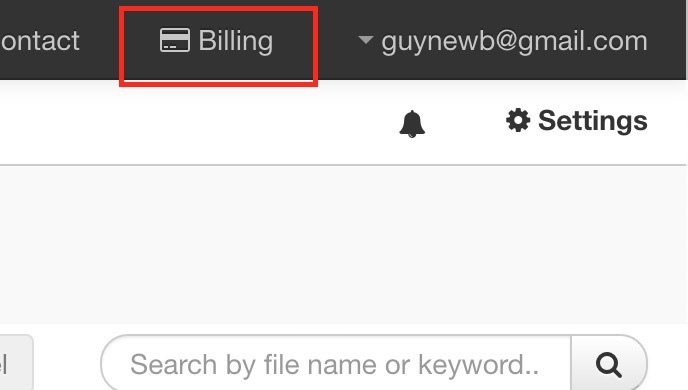 Account Level Billing can be identified when the Billing button is located on the black bar at the very top of the page. Project Level Billing can be identified when the Billing button is located below your email address to the immediate left of the Settings icon. Enterprise or Universities that have different departments with different budgets may want to set up project level billing. Perhaps XYZ University wants project level billing because the Math department relies on a different budget and/or payment method than the History department. Another reason for having 3Play Media configure your account for project level billing is perhaps because each department within an academic or enterprise setting already has a dedicated billing contact. This contact can be added to a project specific to their department to pay their department's invoices.